Louis Tomlinson, Manchester, July 24, 2017. In a 2008 interview with the Financial Times, Russian designer and photographer Gosha Rubchinskiy said of his clothing line, “I am the future. In 10 years, everyone will be talking about Gosha”. Fast forward less than 10 years and the brand is at the forefront of the streetwear phenomenon and is favored by many, including our very own Louis Tomlinson. 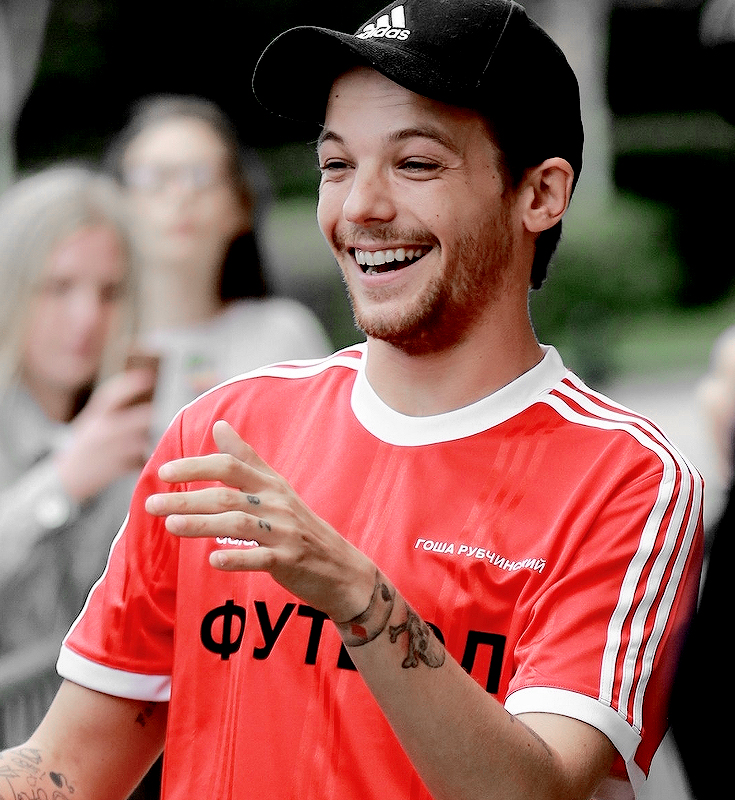 Tomlinson's fashion choices are followed closely by his legions of fans, with blogs and social media accounts set-up specifically to track and source everything he wears. So when he stepped out in the brand for the first time in March 2017, albeit it hidden under a Vintage Kappa England Shell Jacket, there was a natural curiosity from many, coupled with shrieks of jubilation from others who recognised the brand immediately. L to R: March 20, 2017 | March 25, 2017 | July 21, 2017 | July 24, 2017. So, what is streetwear? For the uninitiated, streetwear is derived from humble beginnings, traditionally on the opposite side of the spectrum of High Fashion in terms of pricing and representation. Embraced by varying youth subculture, it is often used as a form of identity and expression. As it has developed, these lines between streetwear and mainstream fashion have started to blur with collaborations growing in prevalence; Supreme x Louis Vuitton, BAPE x Adidas Originals, and Vetements x Reebok to name but a few. "Streetwear has become a global language, and that’s a pretty powerful thing when you think about what’s going on in the world right now.....In a world that’s spiralling deeper and deeper into isolationism and 'us' versus 'them' narratives, streetwear’s ability to speak across borders, languages and timezones is more important than ever." Alex Leach, Highsnobiety. Louis Tomlinson, Ultra Festival, March 25, 2017. 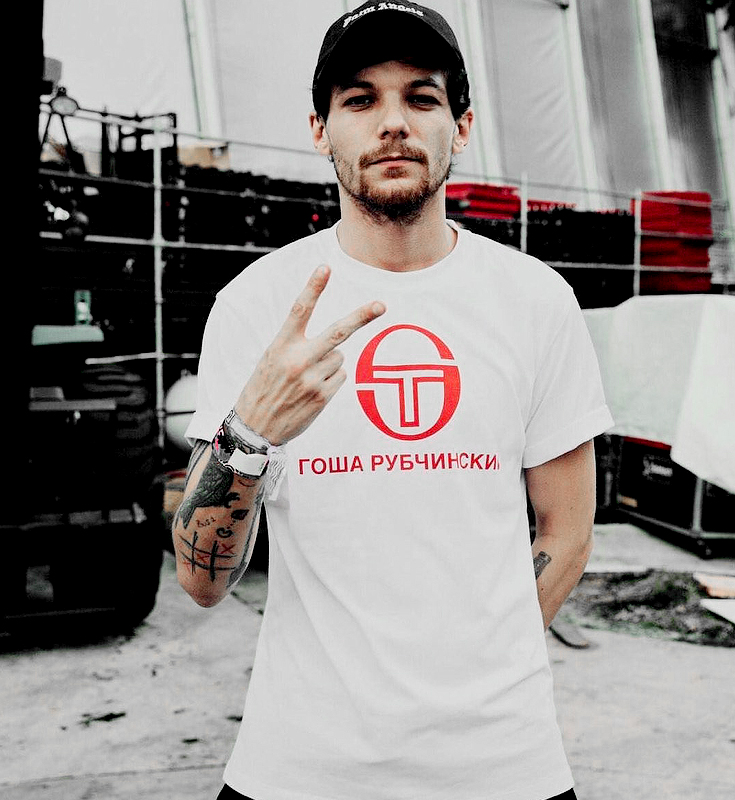 Throughout 2017, Tomlinson hasn't gone long without the recognisable Гоша Рубчинскийis donned on his chest, his legs or the tongue of his much beloved sneakers. Whether lounging at home with his dog Clifford (below), during his UK radio promotion tour (July), at the Teen Choice Awards (August), supporting Niall Horan at his show in LA (September), and most notably wearing a SS17 Gosha collaboration with Sergio Tacchini T-Shirt on stage at Ultra Music Festival (above), his love for the brand appears to be clear. Louis Tomlinson, Instagram, June 7, 2017. With a brand aimed towards the youth, Gosha Rubchinskiy has found an ardent supporter in Tomlinson, a man who is both young at heart and young in spirit. L to R: July 24, 2017 | August 5, 2017 | September 21, 2017 | September 22, 2017.